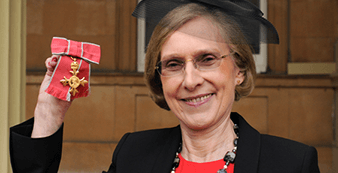 Mary Ritter, Climate-KIC’s Chief Executive Officer, was presented with an OBE by Prince Charles at Buckingham Palace this week (12 February 2014). The Queen appoints new members of the Order of the British Empire, on the advice of the UK government. Professor Ritter was appointed Officer of the Most Excellent Order of the British Empire for services to scientific research and innovation. “It is a great honour to be recognised for my contribution, alongside that of the whole Climate-KIC team, to one of the major challenges facing mankind,” Ritter said. The long-planned ceremony coincided with one of the worst storms to hit the UK so far this winter, which has caused large areas of England and Wales to be flooded and has put tens of thousands of homes without power. In the three years that Mary Ritter has been at the helm, Climate-KIC’s public-private partnership has grown from a membership of 15 organisations with a €6 million budget, to a community of over 200 partners across Europe from business, academia and the public sector, with a budget of more than €70 million for 2014 and a mission to mitigate and adapt to climate change while creating sustainable growth and jobs. “The citation is for ‘Services to Scientific Research and Innovation’ and in the context of innovation, although I have been a serial entrepreneur within the academic context, I am particularly proud of my most recent, and biggest, challenge – leading Climate-KIC,” said Ritter. Before joining Climate-KIC, Professor Ritter’s research focused on how the immune system develops in the fetus and how it declines in elderly people. She also developed new research products, and established new postgraduate programmes at Imperial College London. Professor Ritter launched the College’s first Graduate School and played a key role in the establishment of the joint Imperial-NTU Lee Kong Chian medical school in Singapore. As Pro-Rector, she oversaw Postgraduate Affairs at Imperial from 2004 to 2007 and International Affairs from 2005 to 2011.